Recommended ages 1- 6 yrs. Cost is only $5 per child. You will pay the day of the class. We will be using air dry clay to make your own fun creation. We will be using air-dry clay. You will be taking these home that day. If you have other siblings that would like to participate, be sure to sign them up. 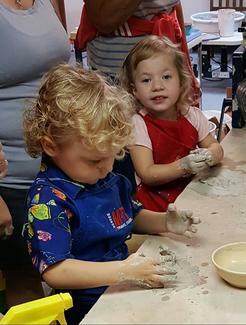 Young children, when given a piece of ordinary soft pottery clay, are instinctively motivated to explore its inviting soft and responsive sensory qualities. They poke it, squeeze it, hit it, pick it up and pound it down, and so on. Each time they act on the clay, the clay adjusts and responds. These changes mean very little to us as adults, but for young children these changes in the clay are magical. The child is naturally fascinated, motivated, and empowered to keep experimenting. Enter through the West side door with ramp. Because of the limited seating, if you can't make it, be sure to cancel your sign up. That way others will have a chance to sign up.